We have had the same red couch for over 9 years now. When I bought it, I wanted something with some color…I wasn’t thinking ahead. I momentarily forgot that I am a schizophrenic decorator. I didn’t think about how often I love to change things, I just jumped. Two years later I was completely over the red. I wanted more blue in my life. So, I tried to find pillows that would help bring in a little more blue. That didn’t do it for me. I brought up buying a new couch to Matt and he gently reminded me that we spent a fortune on the red one that I just had to have at Haverty’s. Not happening. So, I decorated around my red couch for 9 years. Then, IKEA happened. I went on a mini shopping spree at IKEA a few months back, and noticed that their Ektorp sofa was strangely similar to my couch…even better…the white slipcover that fits the Ektorp sofa was only $100!!! So, I started my campaign for a white slipcovered couch. Matt was all, “No way we can have a white couch…kids, dog, yada yada yada…” Then he joined a bowling league…random I know, but oh he needed a new ball, and a new bag, and new bowling shoes, so I took full advantage and said, sounds good if I can get that white slipcover. I had him right where I wanted him, and so the white IKEA Ektorp slipcover was mine…bahahahaha! I waited for 3 weeks for it to come…oh, that was tough. I’m kind of an instant gratification kind of girl, so it was painful! So there I was one day hanging out on G+ video chat with my girls Gwen and Courtenay when the doorbell rang! It was finally here! I ripped it out of the box and put in on my couch while I was talking to the girls. I finally had to get off of the computer so I could sit on my new couch and accessorize her with some pillows and blankets…isn’t she devine??? 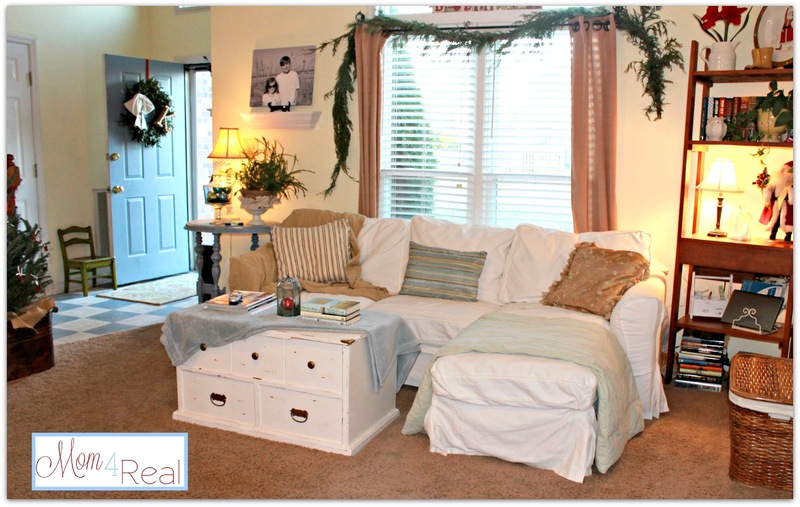 The white is sooo much more me than red…doesn’t it just brighten up my living room? I used to spend all of my time in my breakfast nook, but now, I can’t seem to get my hiney off of the couch. It’s my new favorite spot in the house…serene and a bit beachy…even if it’s the middle of December. 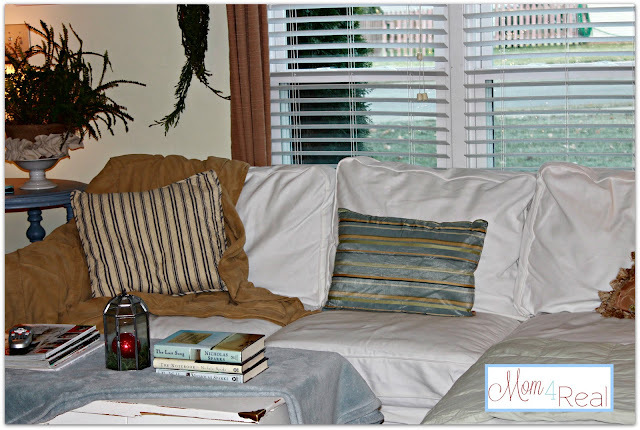 Do you use slipcovers? Do you dare have a white couch? Oh how I love slipcovers! They are the greatest decorating item invented! I found my covers at j c penney’s outlet store for $29 each. Yes I now own several slipcovers! There’s something about the white and sand colors that make me feel closer to the beach even in DEC. I love what you have done with your home! Oh, that really does change the whole room! So glad you decided to share it and let us finally see! It makes the whole room look bigger too! It really looks great, Jessica. It’s amazing how much brighter your room really looks. Beautiful! The white really freshens up the whole room and allows all your lovely accessories to shine through!! Love it! 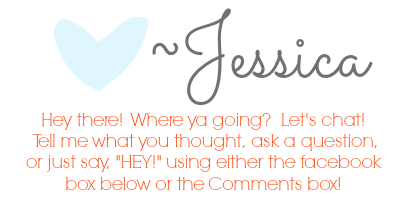 Jessica – it would drive me crazy to wait for 3 weeks for it too! Your sofa looks so amazing now and really changes the entire room! I love Ikea, we have a huuuuge one here – you’ll have to come and visit me so we can shop and eat meatballs! :D Love your Christmas decor! These look great, it changed the look of the whole living. Lovely! What a huge difference!! Love it, Jessica! Oh Jess its fabulous. Love a white, slip covered sofa. How fun, you can change all you extras now on a whim and it’ll match!! 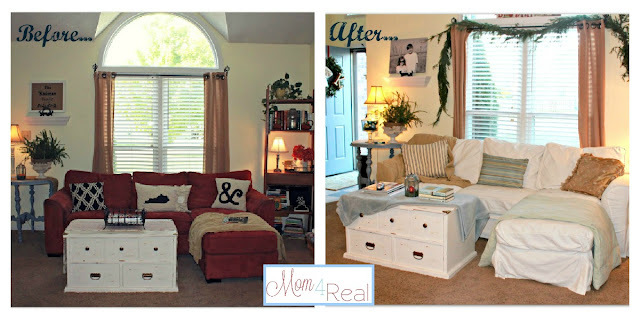 Great slipcover Jessica….love how it changed the look of your room…it’s beautiful…it is no wonder you are so very happy with it!! I’m so jealous! I just sold our couch because I didn’t want to hand make a slip cover for each cushion & it had a chaise too! I love how this turned out, seriously this is awesome! Ooooh the possibilities with a white slip cover!! Definitely brightens your room!! Wow! What a huge difference! I have a super comfy but oh so dated armchair in my bedroom that is in dire need of a slipcover but I’m not sure where to get a good one yet. You’ve motivated me to go look around some more! The slipcover really brightens things up. Hi Jessica, I saw your post on the linky party and I could’nt resist clicking on to see your slipcovers. I love them! I’ve had white slipcovers for years with boys and dogs too. I’ve washed them so much theve actually shrunk and I want another set but can’t afford. They were professionally made, gulp. But never regretted the white. 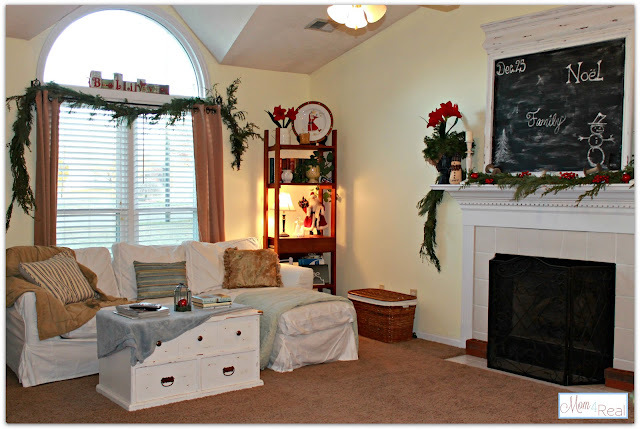 If you’re curious how they’ve held up you can visit ny holiday home tour I just posted. So happy to meet you! From one schizophrenic decorator to another I LURVE my Ikea Ektorp. I have 2 teenagers, a baby and a new puppy and I don’t regret for 1 second having white. When it gets dirty (and it has to be really dirty for this) I just throw it in the wash! Easy-peasy. One piece of advice – a lint brush works wonders for a quick clean-up. If you want the slipcover to fit a little bit tighter, lay some quilt batting over the sofa arms and wrap it around the sofa cushions. That should let the cover lie smoother without affecting the comfiness of your couch. I love the makeover, btw. While the red couch is nice, the white just looks so perfect with the room. Hi. What was the size of the sofa? I am trying to figure out if it will fit the Bennett Sofa by Ethan Allen. Thank you for sharing I have been in love with a white cover.look at many reviews.nice to know that the cover. Fits other couches.is great..I’m so ready.